"True-to-Life Football! ", "¡Fútbol Americano Realiste! ", "Football Réaliste!" 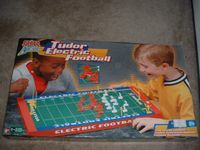 - 2003 edition of Electric Football.